"You won't even need a microscope to dive into the realm of the earth's tiniest organism's with the help of this cool in-depth guidebook. Accessible and engaging, this book will open young readers' eyes to the teeny tiny world hiding just of sight." Nicola Davies is a zoologist and an award-winning author whose many books for children include Surprising Sharks, Extreme Animals, and Gaia Warriors. She lives in Wales. Emily Sutton has a degree in illustration from Edinburgh College of Art. She says, “Illustrating Tiny Creatures has opened my eyes to the incredible and unexpected beauty of a world so small that it can’t be seen without a microscope. I was amazed by the variety and complexity of microbes, and I loved drawing all of their intricate details and patterns.” She lives in York, England. By the end of the book, Davies and Sutton have beautifully made the case that microbes are “the invisible transformers of our world — the tiniest lives doing some of the biggest jobs.” Both Davies’s tone and the charming retro-ish watercolor illustrations by Sutton seem likely to please young children by balancing repetition and flights of fancy. Davies here presents examples of microbial life and the work that microbes do. This experienced science communicator makes an immediate connection to her readers, using their prior knowledge of big whales and small ants to convey how tiny microbes can be. ... Sutton’s watercolor illustrations support and enhance the text. Thoughtful book design adds to the appeal, with generous white space, illustrative vignettes as well as paintings that fill a page or a spread, and an unusually legible type. This will show well when read aloud and intrigue emergent readers. Very little information is available for this age group about these microscopic creatures, making this an especially welcome introduction. Davies’s writing is straightforward but not dry; in fact, she puts the scale and numbers of microbes into fascinating contexts. ... Sutton’s folk-art illustrations are rendered in earthy tones on creamy paper and feature two smiling kiddos and a winsome cat, making for a warm visual presentation (who’d have thought a paramecium could be pretty?). This really is an enjoyable beginner’s look at these miniscule organisms and the effect they can have on everything from our bodies to the soil to the clouds in the sky. A straightforward narrative packed with comparisons sheds light on “the invisible transformers of our world,” while clever, inviting watercolors help put those comparisons into context. Sutton’s paintings, reminiscent of mid 20th-century children’s book art with their subtle hues and naïve styling, lend a nostalgic, almost cozy feel to the pages. ... Davies and Sutton illuminate the world of germs, fermenters, and composters in a charming, succinct package. Davies introduces a likely brand-new—and immediately intriguing—concept to young readers: that there are vast quantities of living things (microbes) that are smaller than the eye can see. She does it not with dull lists of Latin terms and classification charts but instead through creative, easy-to-relate-to analogies, and itchy-but-cool facts about the microbes that live on and in us. An emphasis on scale, particularly size and quantity, helps children grasp the abstract concepts... The tone is light and inquisitive yet also scientifically precise, covering topics such as the shape and variety of microbes, their function, and reproduction. Using well-drawn pictures and simple, scientific text readers see microbes up close in their stunning variety of shapes and sizes. Two young children accompany this microbe journey, providing a backdrop of our world where microbes are constantly in action. This book is a wonderful introduction to the microscopic world of microbes. Simple descriptions and comparisons help explain this group of organisms... The colorful examples and vivid explanations help bring this unseen world to life. ... The figures, in a retro autumnal palette on cream matte pages, have a charming naïveté. 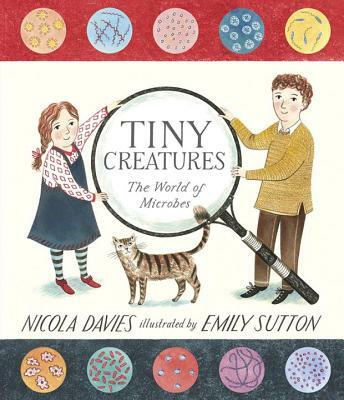 Nicola Davies imparts a sense of wonder at the variety and abundance of near-invisible life-forms in “Tiny Creatures: The World of Microbes," which owes its appeal as much to Emily Sutton’s beautiful, slightly old-fashioned illustrations as to the author’s clear and simple writing. For curious minds and budding scientists, this introduction makes the giant job of minuscule microbes understandable and fascinating. This book makes the invisible familiar and provides a foundation for a friendly, not adversarial, relationship between tiny people and tiny creatures.